Hey guys! I’m back again with another blog. Honestly feel like I’m on a roll. Trying my very best to make these posts as consistent (and great) as possible. (Quality over Quantity and alla that). Anyways.. enough of me rambling on.. Thought I would try something different with this blog post.. as of recently I have finally decided to get back into the habit of reading.. YESSS, reading, I know. Anyways.. after thoroughly surfing through Kindle.. 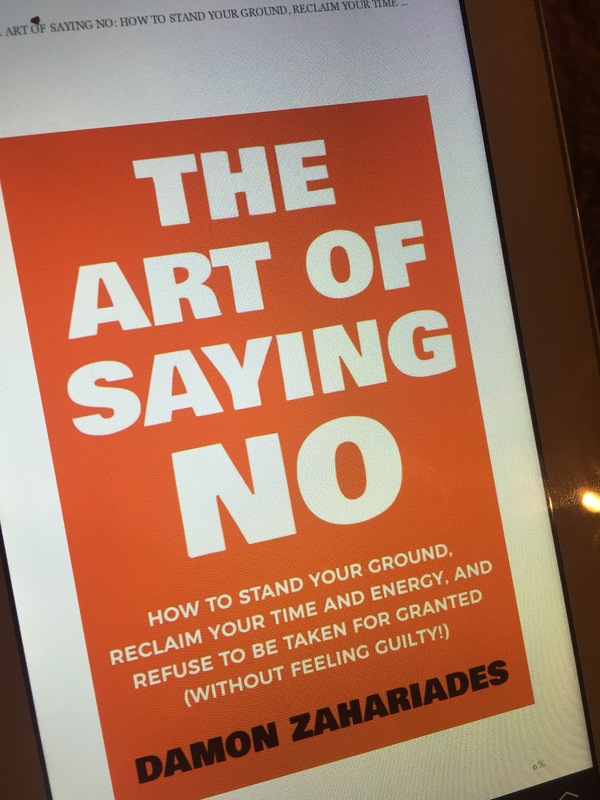 I came across a couple of books which plucked my interest, but this book ‘The Art Of Saying No: How To Stand Your Ground, Reclaim Your Time and Energy and Refuse to Be Taken for Granted (Without Feeling Guilty)’ by Damon Zahariades – I know such a lengthy title lol. This book is for the people who are like me lol, who struggle with a solid and stand your ground “no”. Not because we struggle to mutter the word. But because we are afraid the other party may perceive us as non-reliable, or even selfish. This book offers great content on getting into the habit of saying no, reasons why we struggle to say no as well as strategies for saying no without being rude. So here I just wanted to discuss the book in a bit more depth including reasons why saying no should sometimes be a priority, how to be assertive with your no and lastly we’ll discuss some strategies to saying no. Can you drive me to the store? Can you drop me to the airport? Can you help me move my stuff from A to B? Can you drop me at my appointment? We’ve all been there before. Where everyone is requesting some kind of favour from us, despite us ourselves having our own problems or things we have to tend to. I’m not trying to say don’t help others, certainly not. But imagine attending to everyone else’s needs, so often that you begin to miss lunch times or even dinner, give up sleep and miss activities you enjoy. Eventually you will gradually become tired, irritated, annoyed and even miserable that you may not be physically, mentally or emotionally able to help anyone else. 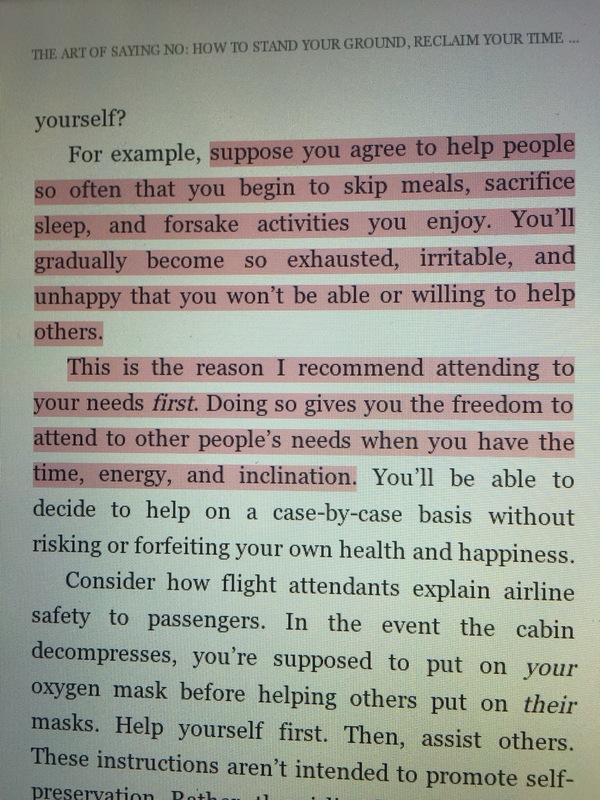 This is the importance of attending to your own needs firsts. So you can then have the freedom to be able to assist others. For example in my personal experience, I’ve always been a person who struggles to say yes, even when I know I have a lot on my plate or in my hand. Lately, I’ve either been mastering the power of no and not feeling guilty. Making my priorities the centre of it all. (Ohh gosh I sound so selfish looool). But it’s what I need to do. Being assertive with your “No”. 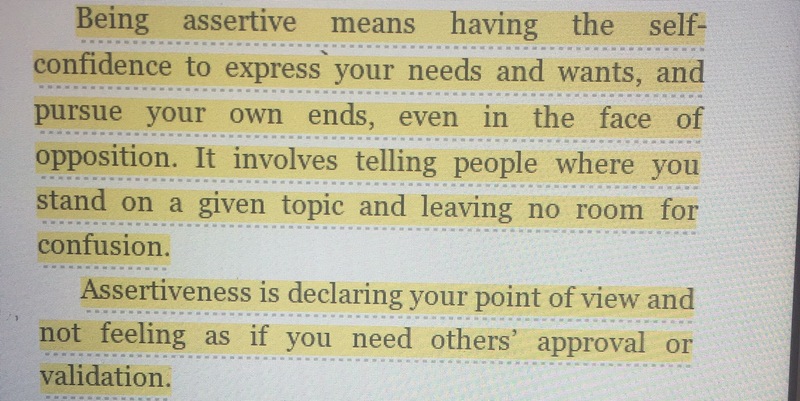 Firstly let’s look at the meaning of being assertive or assertiveness. Being assertive in its most basic form in candid communication. Nothing else. This can be developed with training and practice. Assertiveness is suppose you’re watching a movie in the cinema and the person two rows to the left from you is talking loudly. Assertiveness is asking her to kindly lower her voice or asking her to turn her phone off. As you learn to be assertive, gradually your mindset will begin to change and you will have a willingness to share your ideas with others as well as developing the ability to ask for things you need and want. You also be less afraid to share your opinions. Furthermore and most importantly, you will develop the ability to saying the word ‘No’. Strategies and different ways to say No (without feeling disheartened afterwards). One of the worst feelings and challenges is the aftermath’s of guilt, burden and fear after you’ve told someone no. I can totally relate to this, I hold my hands all the way up. The feeling when you tell someone no and then you wonder if they see you any differently. I’m sure we can all relate. We’ve spent so much time putting the needs of others before ours. However, altering this can take a fair amount of time and effort. Here are a couple of tips which you can apply to gradually get rid of the people pleasing tendencies. Have you ever been in a situation where you yourself have enough on your plate, however your neighbour beside you asks you for a favour or for some help and instead of telling them “I’m sorry, I can’t help, too much going on today” instead you mutter “Ummm.. I might be able to help you, although I am quite busy myself”. Yes? The person then goes onto say “this is super important” or “I desperately need your help with xyz”. Yes? Then you’re caught up helping this person despite your own plate already being full. We’ve all been there I’m sure. The only difference between the first and the second one is that the first response leaves space for the person asking to feel your response is personal. Whereas the second response is clear and direct there’s no reason for the person asking to take your response personally, leaving no room for them to try and swindle you into doing what they want. Quit stalling for time! This is a major one I used to struggle with. We know we don’t have the time nor energy to assist anybody with anything but we drag our feet in giving a response. Similar to the above, be direct and open with your response. Don’t waste time giving them a firm no. The response ‘can I get back to you on that?’ Or ‘I’ll let you know, by the end of the week’ pfffftt stop all of that. The main reason why we do this to be tactful. At times, we don’t want the person asking to feel rejected. Orrr.. We don’t want them to take it personally, another reason this is done is out of fear. Stalling is also done as a delay tactic, we really do want to help this individual but due to our own schedule we are uncertain. However stalling is bad for many reasons. It dangles the person who is asking on, encouraging them to remain hopeful, despite the possibility of you not being able to help. Leaving space for the person asking to become irritated or annoyed. Being direct with a simple “no” portrays respect and stops the request from draping over you. In sum, sometimes saying “no” can do more good than harm. This book is perfect at explaining just that. It’s helpful to people, like myself who struggle with saying no. In addition, to this it is helpful to those of you who find it difficult to say no without feeling guilty. Definitely a book I would recommend. Amazing read. Definitely say this book is an 8/10. Remember there is beauty in saying ‘no’. This book can be bought free with Kindle Unlimited or purchased again on Kindle for a small fee of £2.27.